Professional deep thinker Walter Benjamin wrote a rather dense piece called “The Work of Art in the Age of Mechanical Reproduction” in the 1930s. It explores the role of art in an era capable of producing film, photography, and — most interestingly (to me) — machine copies. He posited that a work of art has an aura, and that that aura is based in its uniqueness. Therefore, every time a student puts up a poster of The Persistence of Memory in their dorm or every time someone sips coffee out of a mug imprinted with Monet’s lilies, the original’s aura is depleted. Benjamin isn’t saying this is necessarily bad, and there’s a lot more to the essay — most of which I’m too obtuse to really wrap my head around, even after reading it several times. But seeing all these reproductions on my computer screen…is that what takes the magic out of the painting? Not according to Tartt’s The Goldfinch. I was struck by how many twists on Benjamin’s essay come rolling in at the end of The Goldfinch (novel). When Theo is in the Netherlands, escaping from the scene of a heist-on-heist, he knows that the painting is authentic the moment he looks at it during the car ride to Amsterdam. It glows with an ethereal light he knows so well. 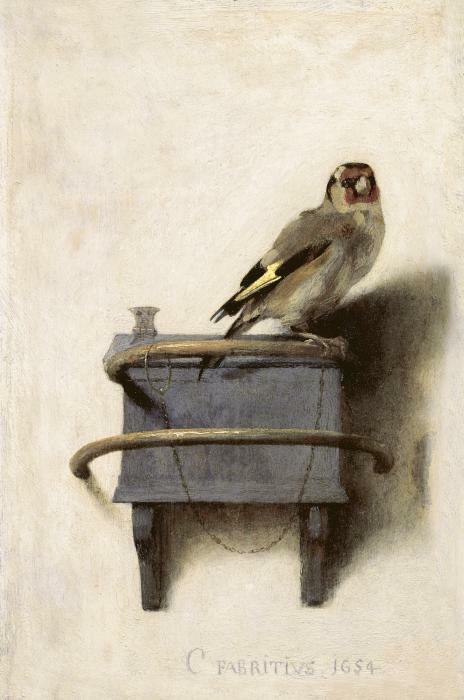 The entire book seems to imply that The Goldfinch (painting) has a soul inside it, defying all of Benjamin’s claims that a painting’s aura is depleted in an age of mechanical reproduction. Surely the painting has been photographed thousands of times, as indicated by my Google image search. In Tartt’s book, Theo sees reproductions of the painting in art books, newspapers, and even a photograph of Welty in a room with a counterfeit. (Which, by the way, is an image of an image of an image of an image. The last image is the bird itself. Intense.) Yet the soul of the thing doesn’t seem the least bit damaged by all its reproductions, at least not to Theo. Even the painting is a reproduction, as Theo knows. He has no doubt that the artist had a live subject, and Boris mentions his certainty that, in a cage full of goldfinches, he could point out with ease the goldfinch. Theo and Boris both seem to believe that they know the bird, as presumably do the many others bewitched by the painting: Welty, Theo’s mother, Lucius Reeve. And yet, at the end, Theo comments that the painting is a trick, a “joke” — these globs of paint and scratches into the canvas and brushstrokes that, as you stand back, transform from what is really just deposited paint into a very convincing representation of a bird. One might point to the painting and say, “It’s a bird,” though really all the viewer is seeing is patterns of paint. How can this reproduction not be a thing that takes from the soul of the bird? How can the painting have a aura its own, if Benjamin is correct? Theo even sees the glow of the painting in a forgery, placed on a wall in an old photograph of Welty as a child. It’s difficult to get further away from the original goldfinch (or original goldfinch painting, even) than this image four times removed. But Hobie, the book’s good-hearted creator of forgeries that he never intends to sell, has an answer for Theo. He guesses that it isn’t the originality or uniqueness of art, as Benjamin suggests, that gives art its aura. It’s the beauty of line. If there is a particularly beautiful shape, it doesn’t matter if the object is reproduced or original. That’s why his lovingly created reproductions of antique furniture were so charming — he was reproducing a thing that had beauty, and he was able to preserve the thing that made it beautiful. It seems that Hobie doesn’t buy into Benjamin’s theory at all. But both believe that the original goldfinch painting in itself would lack the mystic quality Theo assigns it. If Hobie or Benjamin speak true on the subject of the original piece of art lacking a soul–in Hobie’s mind, because it’s the beautiful image of the goldfinch, not the object that is the painting, that’s important; in Benjamin’s mind, because the painting has been reproduced enough to have had its soul depleted)–why is it that Theo so passionately felt that if The Goldfinch (the painting) was destroyed, the world would have lost something important? Why was it so necessary that what he held in his hand was the real thing on the way back to hotel in Amsterdam? I don’t have an answer for this, and I certainly don’t think the novel does, either. And, on another subject, that might be one of my few complaints about the book. I connect so wholeheartedly to this novel. Just about every page of The Goldfinch absorbs me fully. But there is a lot of incoherence in it. That’d normally be fine with me; life is rather incoherent. But it seemed so important to Tartt, especially at the end, to become some sort of lecturer/philosopher. You have to have a special kind of brain for that. A Walter Benjamin brain. One capable of working out a theory, however crazy, to a certain level of completeness. A brain that can reach beyond bland platitudes and reach a hypothesis that, for instance, isn’t so broad that it can’t be wrong. Tartt is a glorious, deep feeling, intelligent author, but she doesn’t have that brain. The end of The Goldfinch could have saved if Tartt stayed in-novel. The parts where Boris and Hobie sit down and start talking about “You know, maybe bad deeds can result in something good” is pretty cheesy in a folksy, from-the-mouths-of babes, “Well, little ‘ol me don’t know much about ____, but I’s been thinking…” type of way. But it was tolerable. The whole meta-lecture from Theo at the end, on the other hand, (which goes on for pages and pages) is insufferable. I just went tearing through it the first time, since it was two in the morning and I could see I was close to finished. But this time I sat through every word, focused. It isn’t horrible writing, but it’s patronizing, and it takes you waaaaaay out of the novel to treat you to some “big thought,” stoner ending. The end of the book meant well–it meant to bring us closure after all these pages filled with Theo’s ongoing, unspeakable sadness. But it was reminiscent of–horror of all horrors–John Galt’s speech (a.k.a. Ayn Rand’s excuse to bluster incoherently about her personal world view for a sickening number of pages) in Atlas Shrugged. Ending aside, I remain firm after my second reading. The Goldfinch is a spectacular book, full of aching feelings and beautiful intricacies. It contains endless starting points for conversation with others, but it will at the same time be a deeply personal experience for the reader to have. It brought to my mind many philosophies of which I’ve read–not just those of Benjamin, but also those of aesthetes and critics from many fields and varied time periods. It’s a great introduction to ways of thinking about art. as well as to good literature. It’s easy to assume Theo is attached to the goldfinch painting because it’s his last connection to his mother. And that may be so. But I think there’s more there. And Theo, especially after his trauma, continues to find objects, not people, his anchor. He feels utterly lost when he realizes he no longer has access to his painting. He immerses himself in the touch and feel of the furniture he works on with Hobie. Certainly he finds solace in a few people here and there, but what he finds the deepest connections with are not people, but things. There is one exception. The way he describes Pippa in the book is very similar to the way he describes the objects he attaches to. He notes her attributes, like her hair and clothing, with the same sort of fetishism with which he describes his totems. I wouldn’t probably go as far as to say Theo sees her as an object. In fact, I think part of what draws him to Pippa is the fact that he cannot possess her like he can an object. Theo’s a deep-feeling, intensely spiritual person, even from childhood, so it makes sense that he doesn’t objectify people quite in the context that we’d usually use the term. He does not always know why he experiences the attachments he does–he just records his feelings and leaves them unsorted and unanalysed. I find it understandable, this reluctance to wonder too hard about the reasons behind his emotions. I don’t quite think of him as psychologically insightful, but that’s one of the great things about this character and about the book. It allows the reader to do the psychological work. Theo in some ways reminds me of a character from a book I haven’t read in a long time: Joyce’s A Portrait of the Artist as a Young Man. Theo is an aesthetician (an old-school one, not the kind you find at the Clinique counter), but there’s a desperate quality to his appreciation of beauty. When he learns that people can be lost, he connects instead with objects. Then, when he realizes objects can also be lost even when the greatest care is taken to preserve them, well, that’s pretty rough. There are a lot of negative reviews of The Goldfinch out there from those who find contrarian delights in raging against the literary machine. There are accusations of juvenility and uninventive language. Props to them for their reluctance to accept a well-acclaimed book simply because it is well-acclaimed, but in this case, they’re just bitter. The book makes us take a juvenile seriously, and any moments of cliche (“tip of the iceberg,” for example) add an element of conversation and authenticity. Take this as a clearly biased report from Camp Goldfinch. “Think for yourself; question authority,” as the great band Tool advises, but read the book. You’ll decide. Here is a much better synopsis than my own from the New York TImes‘ Book Review. As a loud and proud feminist, this is the worst thing I will ever say. (Yes, leave it to me to think of the worst thing I will ever say and then immediately put it on the internet.) I finished The Goldfinch before even looking to see who the author was, and I was shocked to learn it was written by a female. I had a discussion with a very forward-thinking teacher once about why I don’t like female writers as much as male ones, historically. He, too, very much resented himself for feeling like male authors seemed to create more depth in their work. But, as ashamed as it made us, it just seemed true. There are glowing exceptions, of course (Eliot, Chopin, the Brontes), but even they seemed to have heteronormative-relationship-driven plots, with romance being at least one of the major (if not the) key theme. In fact, I think this is why I resented Anna Karenina. It seemed to me a very “female author” book–all about man-woman pairings and dynamics. I think about Whitman’s claim that he contained multitudes, and it seems to be the anti-anthem of the novelists I don’t like (who, unfortunately, often tend to be women). “I contain the potential for romance” seems to be the driving force behind it all. We have been and are entering a new era of women writers. I don’t know why, after reading books from Jennifer Egan and Toni Morrison, I still have lower expectations. But The Goldfinch solidifies it. This is a deep and rich book that explores so many facets of human existence, with an absolutely riveting plot the whole way through. It’s multidimensional and complex psychologically while carrying with it a story that captivates. The climax of the book went on forever, and I got four hours of sleep one night because I couldn’t put it down. In fact, this whole enormous book was enrapturing the entire way through. In fact (x 2), the reason I haven’t posted about it yet is because I accidentally started reading the whole thing again. I couldn’t help myself. I wanted to be back in this world of multitudes. First off, this book even the sentence level is fresh. You know what’s really hard to do without entering cliche-land? Similes. Try writing a simile that doesn’t sound like bad poetry. Do it, right now. I’ll wait. It was bad, wasn’t it? This book is filled with similes that are gorgeous and vibrant and don’t stick out as similes. Here is where I would put examples, but I’ll just make that another post if need be. This sucker’s gonna be long enough. Second of all, the book paints so many beautiful portraits of people, and it does so by showing, not telling. The main character is a prime example of this.We get to know him so well, and yet we don’t even understand what the goldfinch painting held so dear by the narrator means to him. Not even he knows, really. It just does, for reasons seemingly obvious but that will escape articulation if we try to explain it. Again, deserves an entire post in itself. Every one of the characters is complex and yet understandable, even the bit players like Tom Cable. Third, author Donna Tartt does the passage of time so amazingly well. There is an “eight years later” jump at one point, but I think it helps character development. All of a sudden, our poor hero is in an unexpected place, and we learn how he got there. It all makes perfect sense, yet it’s surprising. The most amazing example of the passage of time is the way the author explains the development of what winds up being the extremely close friendship between the main character and Boris in Las Vegas. It develops naturally and beautifully. Speaking as someone who has a friendship very much like the one described in the book, the coverage of the time was so natural and the closeness that developed made so much sense. It all rang authentic in my mind. That, like the non-cliched simile, is very, very hard to pull off. But my main takeaway from this book is that, even though the world of The Goldfinch is a fairly sad one, it’s a place I love to be. It envelops me. It rings true and real and beautiful. It’s heartbreaking without being sentimental, and it’s raw without being dramatic.The Goldfinch doesn’t pull any punches. It’s as complicated and involving as it is without gimmicks. Clearly, this is a vague overview. I haven’t really said much of anything about the book. This is a real challenge for me to write about because it’s like someone asking me to try to describe my existence on this planet in a blog post. I’d just be left dumbfounded. There’s too much, far too much. The Goldfinch contains multitudes, and all we can hope to do it examine it piece by piece, I think. The whole of it is too far beyond words. That the author created these multitudes in the 700+ pages of this book is an impressive feat in itself. 700 pages wouldn’t be enough for me.